Alexander son of Celia, both mother and son were born free, this day made application in the said office to be registered according to law, It is therefore certified to all whom it may concern that the said Alexander is a yellow boy in the thirteenth year of his age four feet seven inches high has a scar of the left side of the fore head one scar the edge of the left eye a whitish spot on the left side of the neck, no other apparent mark or scar deemed worthy of notice. Virginia. In Louisa County Court Clerks Office November 16.th 1836. Catharine Mary Garland daughter of Celia both Mother and daughter were born free, this day made application in the said office to be registered according to law. It is therefore certified to all whom it may concern that the said Catharine Mary Garland is a yellow girl four feet four inches high about ten years old has a small scar on the forehead but will probably not endure from her youthfulness no other apparent mark or scar deemed worthy of notice. 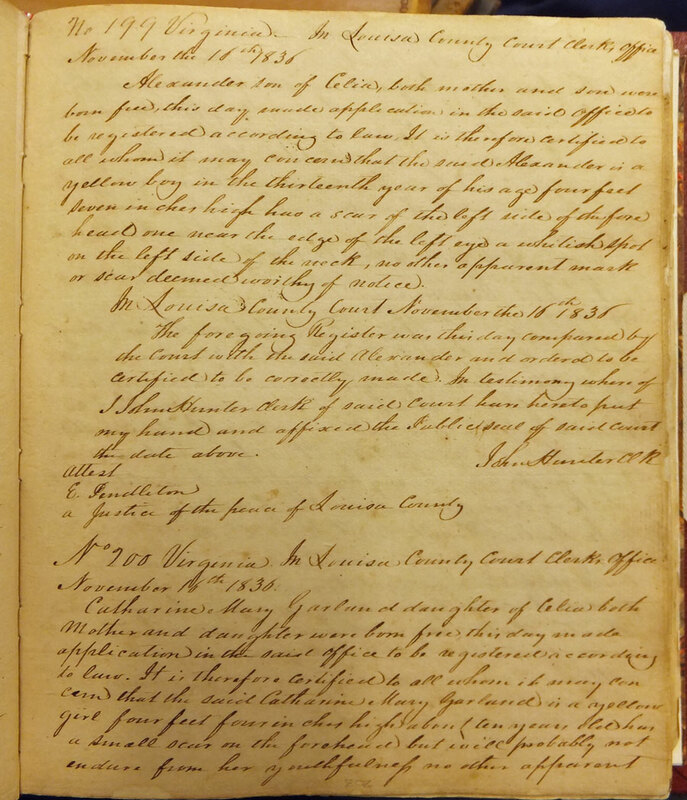 “Louisa County Free Black Register Book 1, No 199 & 200A,” Piedmont Virginia Digital History: The Land Between the Rivers , accessed April 25, 2019, http://piedmontvahistory.org/archives14/index.php/items/show/627.